A Medicare supplement is a type of health insurance sold by private insurers to cover the gaps in Medicare. This is what we refer to the plans as “Medigap Plans. When our clients are shopping for a Medicare Supplement policy, they are usually considering a Plan F, a Plan G, or a Plan N. Here’s an easy way to think of a Medicare supplement. Picture it as a card that sort of bolts onto the back of your Original Medicare. It serves to pay for the costs that normally Medicare would pass on to you. 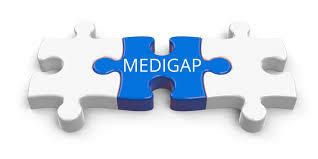 Medicare has gaps, like coinsurance, co-payments, and deductibles. You must pay for these when accessing medically-approved services. Every Medicare supplement has to follow the guidelines created by Medicare itself when it standardized all plans in 1990. Each standardized plan is identified by a letter. Medicare calls them plans. There is Medigap Plan A, Plan B, Plan C, D, F, G, K, L, M and N. Each one of these lettered policies provides the same set of benefits from company to company. What is a Medicare Supplement Plan F? Medicare Supplement Plan F is one of the most popular supplements. It pays 100% of the costs that Medicare would normally bill to you. This means that when you have Medicare Supplement Plan F, you will not be responsible for any Medicare-related deductibles. You will not have any co-pays. Plan F will pay ALL of your share. Medicare Supplement Plan G has been gaining in popularity in recent years. It functions exactly like Plan F, except for the Part B deductible. 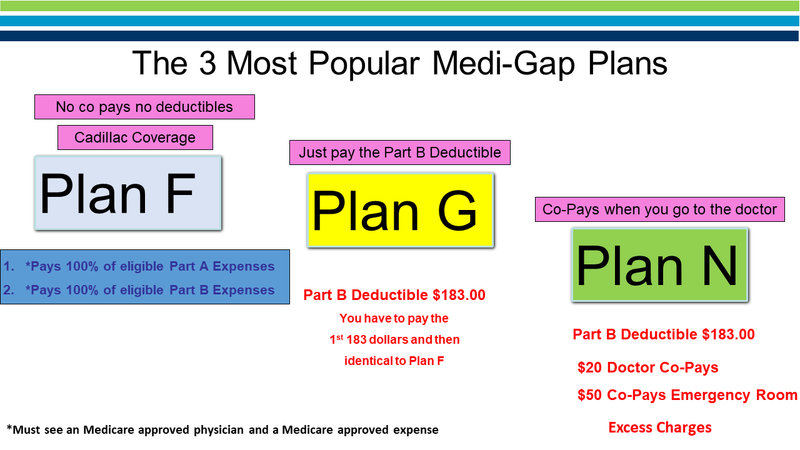 You agree to pay the Part B deductible each year, and after that, the Plan G will pick up the rest. The Part B deductible is $183 per year. Quite often we can find Medicare Supplement Plan G premiums that save you more than $183/year. This means that you come out ahead in the long run and many Seniors feel it tends to be a better value Plan then Plan F.
Medicare Supplement Plan N is one of the newer Medigap plans. It was first offered in 2010. A Plan N will usually have lower premiums than Plan F or Plan G. However you will do more cost-sharing along the way. You will pay a doctor copay up to $20 each time you see a doctor. Copays also include $50 for an emergency room visit. You will also be responsible for excess charges. Some doctors bill an extra 15% above Medicare’s rate. This is called an Excess Charge. Plan F or Plan G take care of this for you. On Plan N, you pay the excess charge yourself. If you would like more information on these Plans, please contact a member of our customer service team here at Golden Years Design Benefits, we have been assisting Seniors with Medicare Plans for nearly 30 Years.